In February Simon Ricketts, a Hastings graduates of 1993 and now a senior Guardian journalist, dropped a bombshell on Twitter. He was off for an operation. This was no simple affair - one that involved sawing his breastbone in half, opening his ribcage, lowering his body temperature so that his heart stopped and then – through an artery – they had to take blood clots/scar tissue out of his lungs. Late one Sunday evening last month Simon made a little announcement on Twitter. Here it is - an amazing read - and then he disappeared. The best thing that happened today was that he returned. His first Tweet back was 'Sorry I haven't tweeted for a while. I've been queueing for petrol.' His second told the story of what he has been up to since that last Tweet. A fantastic read and fantastic news. Welcome back. 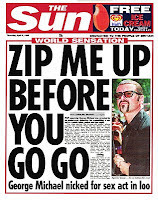 Tabloid headline writers have always used song lyrics as part of their toolkit - sometimes to stunning effect. 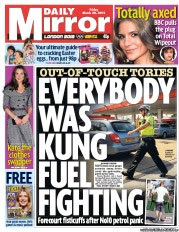 Today's Daily Mirror splash, taken from Carl Douglas's Kung Fu Fighting, is a fine effort. As veteran editor Mike Lowe @cotslifeeditor observes on Twitter it is an obvious example of the back bench coming up with a splash head and then telling the newsdesk to stand it up. I don't have a problem with that though. 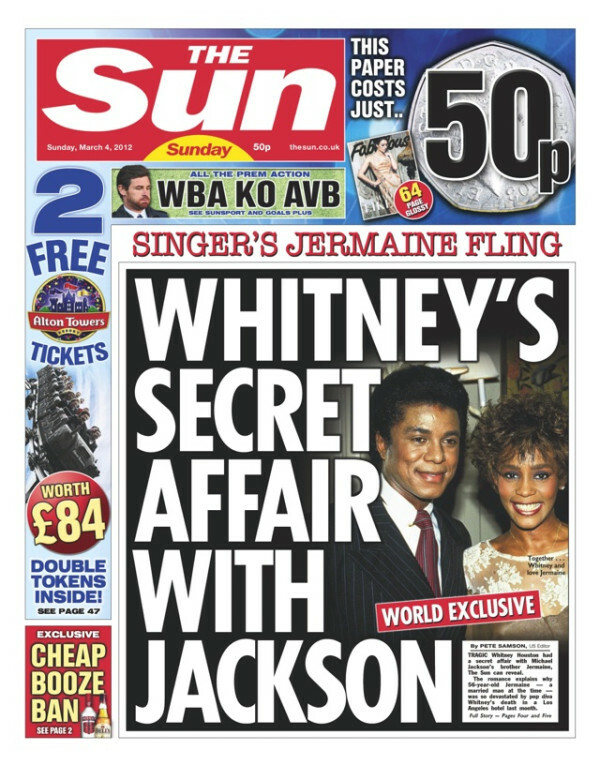 Writing the headline first is an old tabloid trick - although the story does have to stand-up of course. I am in the sticks today so didn't see Metro but @LewisWiltshire reports it has a feature on Greggs with the heading We built this city on sausage rolls. Nice touch. It was a song by Starship in 1985. I wonder, though, how many young London urbanites will have got it. And there's the first tip ... use songs that the vast majority of your readers know. I remember a headline in an Irish paper above a picture of a defendant leaving court and shielding his face which read: It's been a bad day please don't take my picture. It's by REM and isn't even the song title so may just have gone over some people's heads. The second tip is try to make the headline understandable, even if people don't know the song. 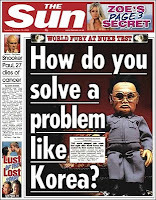 The Sun's excellent How do you solve a problem like Korea? makes sense even if you have never heard of The Sound of Music. The third tip is don't overdo it. When I was working at the Mirror in 1997 we counted 13 song titles in headlines in one issue. We even had a debate over whether Who's Sorry Now? was a song title or had become a phrase ingrained in the language. Anyway, we decided there were too many Frank Sinatra headlines for a paper that was aiming at a young market. Some other notables are Mourn on the Fourth of July, a bit of anti-war poignancy from the Mirror via Springsteen, and the Mail's Diamonds are for weather, when Dame Shirley Bassey donned diamond encrusted wellies in a rainstorm. 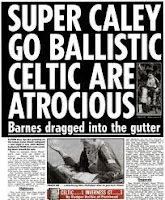 The most famous headlines from song lyrics are, of course, from the Sun ... Zip me up before you go go and Super Caley go ballistic Celtic are atrocious. Tabloid genius. If you have any others let me have them. My email is petersands@mistral.co.uk. Like many people in regional newspapers I was saddened by the deaths of two of the industry's big hitters in the last week. Edwin Boorman was, at different times, managing director, chief executive, chairman and president of the Kent Messenger Group. He died last Wednesday after a short illness. He was 76. Richard Wooldridge was editor and MD of the Yorkshire Evening Press and editorial director of Westminster Press before becoming chief operating officer and president of the International Herald Tribune in Paris. He died, age 69, of a heart attack on Sunday while on a family holiday in Morocco. I worked closely with Richard in the old WP Group and met Edwin many times, I had great respect for both men. However I have asked two former editors and colleagues, who knew Edwin and Richard much better than I did, to pay their own personal tributes. Allan Prosser, my predecessor at The Northern Echo, left the North-East in 1989 to become editorial director at the KM and Martin King worked as Richard's right-hand man at York in the late 80s. Here are their memories of two of the regional Press's giants. Edwin Boorman, the colourful leader of the Kent Messenger Group, who died last week, was one of the few remaining representatives of the dwindling number of dynastic families who shaped and characterised the local press for more than a century. In Edwin's case he passed the torch to his daughter, Geraldine, and maintained the staunch and sturdy independence of his newspaper group while rivals and contemporaries signed a Faustian pact and saw their once proud titles fall into the void in the accounting columns of large groups semi-detached from the communities they profess to serve. I had the pleasure of working with Edwin for four years in the early 90s as his editorial director. It was a period for which the phrase "never a dull moment" might have been coined. A new press was installed; a fascinating joint project established with trans-Manche publishers La Voix du Nord; a successful chain of county-wide free papers further strengthened and a bold attempt made to extend his Medway Towns-based daily newspaper to cover the rest of Kent. While that ultimately failed, the victim both of the dedication in the South-East of newspaper readers to London-based nationals, and the problems of financing such an ambitious plan, it did deliver the valuable by-product of instilling the rhythms of daily publishing across his whole group, ahead of the expansion into the Internet age, and added momentum to the process of unifying all his titles under the over-arching KM brand. Edwin was a highly-committed local publisher who didn't shy away from tough decisions. The KM came close to disaster during a punishing dispute with the print unions over the introduction of new technology - a cause he always espoused - in the 1980s and has remained influential and progressive despite successive recessions and now a grim slump. 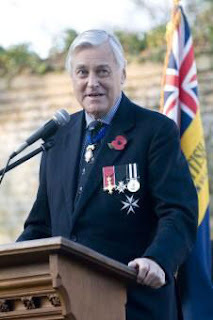 It is typical of the company that he guided for so many years that even at the depth of the economic downturn it was seeking growth last winter by endeavouring to purchase seven Northcliffe titles in Kent, a sensible rationalisation thwarted by the Office of Fair Trading's referral to the Competitions Commission. Some memories can stand to tell the story of the man. During the early 1990s it was proving almost impossible to recruit and retain sub-editors for the KM's titles. From London's back garden there was no shortage of available shifts and better-remunerated opportunities. The company, heavily encouraged by Edwin, established its own excellent training scheme, in the teeth of considerable industry scepticism, to retrain people from non-traditional backgrounds. It was a success, and one more example of the KM's can-do mentality engendered by him. Edwin was a proprietor who enjoyed the status offered by his position, but did not allow his privileges to impede what he viewed as his duty to uphold the freedom of the press. He didn't much enjoy the occasion when his daily paper editor took the decision to publish a transcript of what has gone down in history as the "Camillagate Tape" which brought obloquy down on the chairman's head from the great and good of the county and may even, it's been suggested more than once, have cost him his "K". But Edwin supported the decision, albeit through gritted teeth. And was to be much admired for doing so. And his sense of good natured mischief was something to be treasured. With the opening of the Channel Tunnel Edwin was keen to establish a cross-border partnership with the Nord Pas de Calais morning paper La Voix du Nord and insisted that his executives were hothoused through a course in French. On the way to an important business meeting in Lille with our Gallic allies I warned the chairman not to rely on my grasp of franglais to make any substantive commercial points. Hours later, high in their boardroom overlooking the Place du General de Gaulle, after proposing a toast with excellent champagne and in his fluent French Edwin called for silence and announced that I would now spell out to the assembled throng the KM's vision of the new "grande entente." My baleful stare was returned by his amused smile and a gracious incline of the head in my direction. On one of the last occasions I worked with him we spent a summer evening in the sylvan surroundings of Leeds Castle listening to a concert by Luciano Pavarotti. Edwin, handsome, smiling, champagne flute in hand, wandered around spending time with as many people as he could. And that's how I will remember him on that golden evening, at ease among his own, the men of Kent and the Kentish men. And not forgetting the maids. 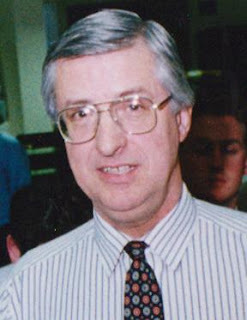 Allan Prosser was editorial director of the Kent Messenger Group 1990-1994. A memorial service will be held for the life of Edwin Boorman at 3pm on April 4 at All Saints Church in Mill Street, Maidstone. Two major facets of Richard’s nature were clear to me just days after I joined The Yorkshire Evening Press, where he had the unusual joint role of Managing Director and Editor. And thus the Hands Off Rowntree campaign was launched (Richard’s instant name for it). And sure enough, every spare coach in North Yorkshire headed off to Westminster just two days later. The first facet was that he was a campaigning editor brave enough to take on a battle he knew he was unlikely to win. But he wanted to give York the pride of at least having its protest and, for a while at least, hopefully improving the terms of the deal for the city. The second facet was the demonstration of how much he challenged his journalists – and how they surprised themselves by raising their game in response. His campaigning was not just restricted to the popular. The call for the closure to traffic of Deangate beside York Minster was met with some scepticism in a traffic-bound city. Richard was right, of course, that the Minster needed more dignified surroundings and that the motorists would soon adapt. All this happened in the late 1980s. Many newspaper executives were still sceptical about the Internet, but not Richard. With a growing role that eventually saw him becoming Editorial Director of the Westminster Press group, he pushed and backed online and group initiatives that were way ahead of its competitors. Richard was also notable for early demands to his staff for greater adherence to the best practices called for by the Press Complaints Commission’s precursors. None of his journalists can have been in doubt of his response to any lapse in standards. After WP was sold to Newsquest in the mid-1990s, Richard became Chief Executive Officer of the International Herald Tribune. The move to Paris was little surprise for those who knew his love of France, where he stayed after his retirement. Richard died on Sunday aged 69 while holidaying in Morocco with his wife Lynda, a former head teacher at Dunnington primary school near York, and daughter Henrietta and son Christopher. Martin King was deputy editor of the Yorkshire Evening Press and editor of the Evening Echo, Basildon. A funeral service will be held in France and a memorial service, details of which are to be arranged, will take place in York later this year. How many headshots can you get on a front page? 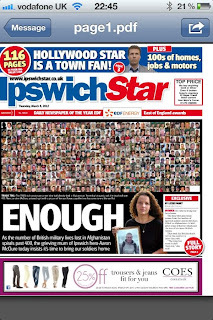 Nigel Pickover's (@Nigel_Pickover) innovative Ipswich Star has more than 300 on the cover today - to get over a poignant message about the number of deaths of soldiers in Afghanistan. Powerful stuff. After last week's lukewarm reaction to the Sun on Sunday, the popular titles seem to fare much better with their front pages this week. 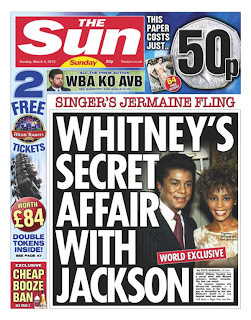 The SoS is a little more like the NOTW with a world exclusive on Whitney Houston's affair with Jermaine Jackson. You can read it on its website and Mail Online has also put the tale up here. Inside the SoS has an interview with MPs Eric Joyce's teenage girlfriend, a classic QTWTAIN asking if Hitler lived until old age in Argentina and a woman who is in love with the Statue of Liberty. The token-collect blurb for free Alton Towers tickets should be enough to persuade many to part with their 50p. 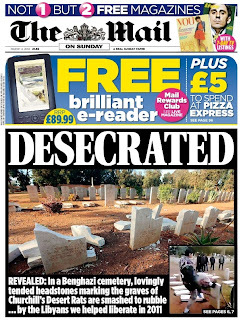 The Mail on Sunday has a picture guaranteed to raise the hackles of many of its readers - the Libyans smashing up the graves of British World War II soldiers. How ungrateful can they be? Strong blurbs too. A far more appealing front than last week's interview with bruised MP Stuart Andrew. 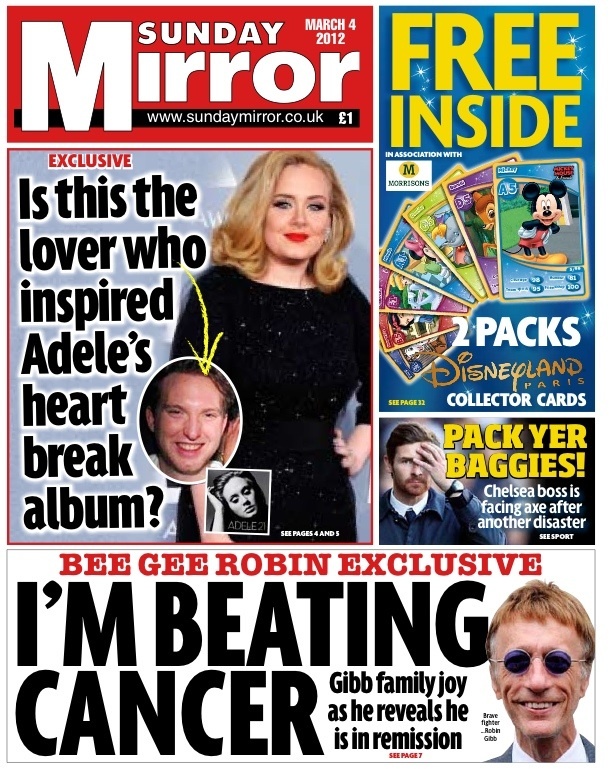 The Sunday Mirror's two showbiz exclusives cover both ends of the popular music spectrum. 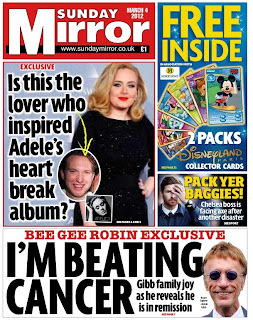 The man who broke Adele's heart (maybe) and Bee Gee Robin Gibb in remission. Much more interesting (to me at least) than the ubiquitous Kerry Katona seeking yet more publicity which the paper splashed last week. The 'Pack your Baggies' headline on the seemingly doomed Chelsea manager made me smile. I was ticked off by @MattChorley for not mentioning the IoS last week (not really at the popular end was my argument) so here it is. 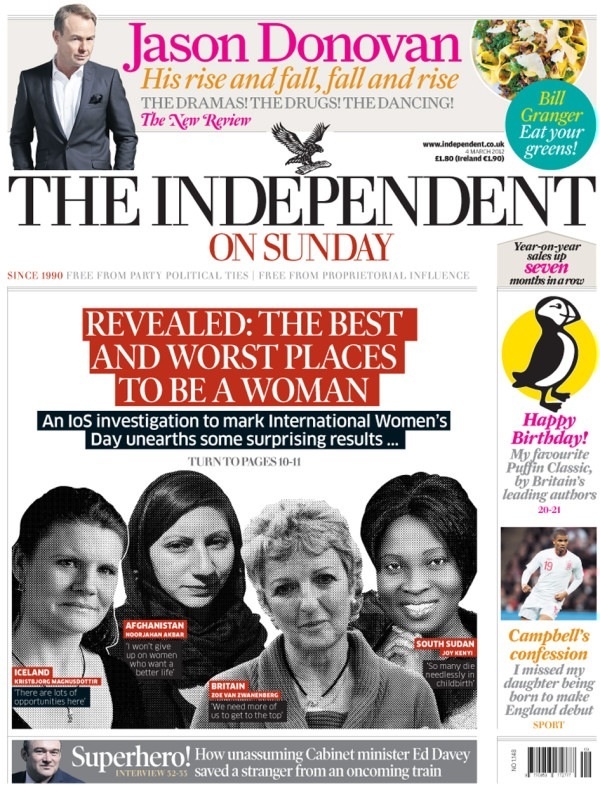 It's International Women's Day on Thursday so the Indie has carried out an investigation on the best and worst places in the world to be a woman. Good piece of forward planning ... and it sounds like a must read. Can't say I'm that fussed about the Jason Donovan story or Bill Granger telling me to eat my greens, but that's probably just me. 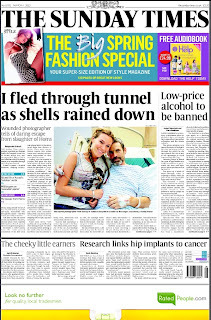 Whatever I pick up at the newsagents though, the Sunday Times will be a must. 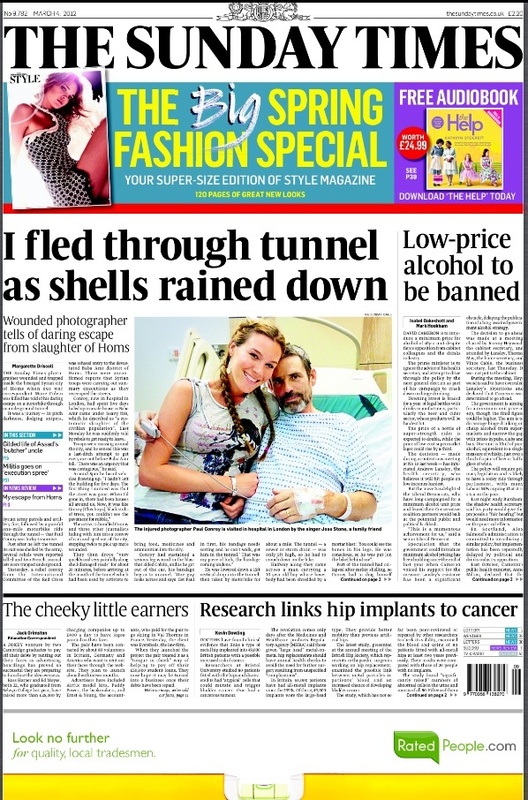 The first person account on how Paul Conroy escaped from Homs could well be the best read of the day. 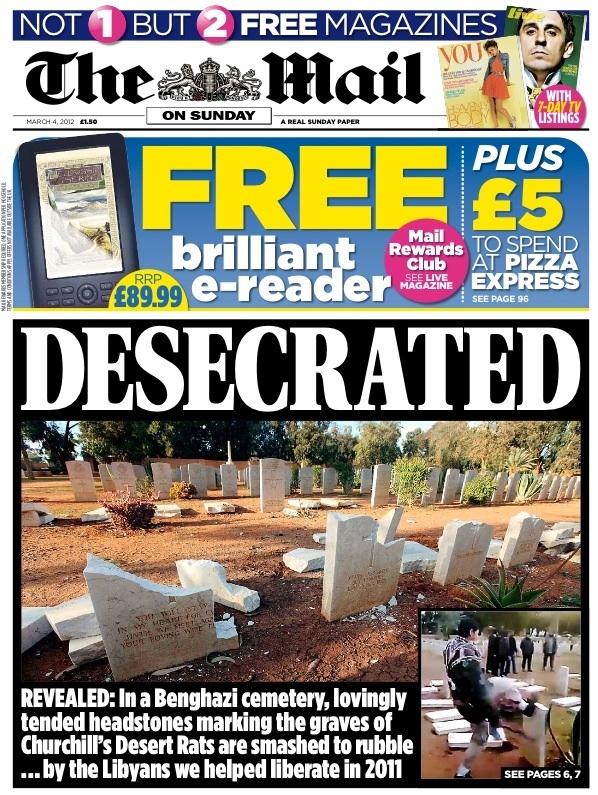 Thanks, as always, to @suttonnick.